Row cover is a light weight spun fabric designed to protect plants from frost. Winters in North Carolina are predictably unpredictable. Spells of mild, frost free weather in January, February and March are commonly interrupted by plunges into arctic cold, when high temperatures struggle to reach above freezing and lows fall into the teens. This roller coaster ride of ups and downs is often more damaging to plants than actual minimum temperatures. Cold snaps that occur later in winter, for example in March as opposed to January, are often more damaging because plants are more likely to have started growth or blossoming. If soils are dry, water the garden or landscape well a few days before extreme cold sets in. Moist soil holds heat longer and is more insulating than dry soil. Clay soils tend to stay adequately moist through a typical NC winter. Additional watering will likely only be necessary in extremely sandy soils or during unusual winter dry spells. Take care to not over water in winter – wet soils increase root and crown rot diseases. Plants growing in containers are more sensitive to cold than plants growing in the ground. Move containers to protected locations such as against the house under the eaves, into a garage or shed, or under dense trees. If containers cannot be moved, wrap the entire container in thick layers of insulating materials such as bubble wrap or old blankets, or build a wire cage around them and fill it with straw. 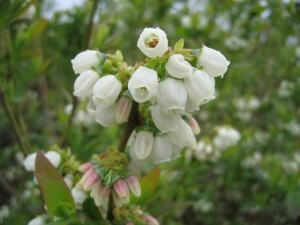 Blossoms, such as these blueberry flowers, are more sensitive to cold than other plant parts. Image by Bill Cline, NCSU. Open blossoms and blossom buds showing color are more sensitive to cold than other plant parts. If you have camellias, blueberries or other early blooming shrubs with open flowers and wish to protect the blossoms, completely cover the bushes with row cover or blankets. Make sure covers extend all the way down to the ground and that they are staked down. Blueberries do not open all their blossoms at one time so even if you lose some blooms in a freeze, your entire crop will not be lost. Cover vegetables and cold sensitive landscape plants such as figs and gardenias during cold spells. Cold hardy vegetables should be covered when temperatures are expected to fall below 25 degrees F. Half hardy or cold sensitive landscape plants should be covered when night time lows are expected to dip below 20 degrees F. Wait until temperatures return to more moderate levels before removing covers even if this means keeping plants covered for several days. Alternatives to row cover include old blankets or other insulating materials. When using row covers or other materials keep in mind double layers provide more protection than single layers. 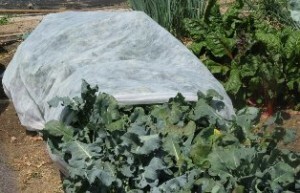 Lay row cover fabrics, blankets, or double layers of plastic directly over crops or build a low frame or hoops out of PVC or other materials to create a mini greenhouse over crops. Uncover crops as soon as milder temperature return. Smaller plants such as strawberries or seedlings can be covered with a thick layer of dry leaves or pine straw. Cover plants completely so that no green tissue is exposed for best protection. For larger shrubs such as figs or gardenias, you can build a wire cage around individual plants and fill it with loose, dry mulch such as hay, pine straw or pine bark. Deciduous shrubs such as figs can be left this way for the winter, though evergreens such as gardenia should be uncovered when the cold spell ends. Cold frames are an alternative to floating row cover. Find out more about building and using cold frames for vegetable gardening from this Missouri Extension fact sheet: click here. Many vegetable farmers use high tunnels, a type of unheated greenhouse, to grow winter crops. If you are serious about growing vegetables year round, consider installing a high tunnel for winter gardening. More information about high tunnels from Extension can be found by clicking here. Not sure which vegetable crops are considered hardy? Check the list in this NC State Extension fact sheet: click here. Crops listed as semi-hardy should be covered when temps fall below 30. Crops listed as hardy should be covered when temps are predicted to fall below 25. 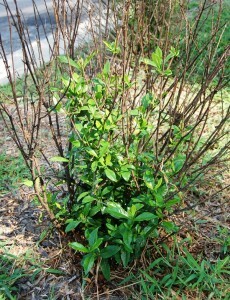 Even when the entire top is killed many shrubs, such as this gardenia, will resprout from the base. Don’t give up on cold injured landscape plants. Even if the entire top is frozen, some cold sensitive woody plants will recover by sprouting from the base or roots. This is common with figs and gardenia, though it may be May or even June before new growth emerges and flowering/fruiting for that season will be delayed. Use Extension Search to find research based information from Cooperative Extension systems across the U.S.
Visit your local Cooperative Extension center to learn more about gardening and landscape care. Find your county Extension center or post your questions to be answered online via Extension’s ‘Ask an Expert’ widget. • Will the Cold Harm My Plants? Looking for a specific person? Try the Chatham County Center Staff Directory, or the Full Directory for N.C. Cooperative Extension.